The most common reason to use Rhino Horn is the effect of getting mental lightness, refreshment, and wellbeing. Everybody knows that taking a shower is not always done because you want to remove dirt from your body. Rather you like the feeling of getting refreshed, feeling alert and ready to meet your day’s challenges. An inner shower of your nasal cavity gives the same feeling of being more alert, present and awake. For many people, the use of Rhino Horn is a good and refreshing start to the day. Having a cold means that a virus has attacked the mucous membranes of the nasal cavity and possibly the pharynx. The membranes get swollen, and they produce excessive mucus. In the early phase of a cold the mucus is thin and running, and later the mucus becomes thicker. The nostrils get clogged making the breathing more difficult. The warm salt water in your Rhino Horn is protecting the mucous membranes from an attack of virus, which means that you are less likely to get a cold if you are using Rhino Horn regularly. When you do have got a cold already, the warm salt water in your Rhino Horn will relax the mucous membranes so that the swollenness is being reduced. Nasal cleansing with Rhino Horn will also remove the excessive mucus so that the natural healing process from the cold will be speeded up. If your nose is clogged, water will not run through your nostrils. You just patiently let the warm salt water stay in the one nostril for a while, empty it, repeat from the other side. You may need to repeat this several times on each side, but eventually, the mucous membranes get that much relaxed that water will be able to run through. This reduction in swollenness means that breathing again will be possible through your nostrils. Normally you will use Rhino Horn once a day. But when you have got a cold, you may use the Rhino Horn several times after the other and also several times during the day. The sinuses are small cavities in the cheekbone and the brows and forehead. Their functions are not very well documented yet, though some knowledge is clear. When you are breathing through your nose, small amounts of Nitromonoxide (NO) from the sinuses are following the air into your lungs. This small amount of NO enhances the transport of Oxigene (O2) from your lungs into your bloodstream. In this way, you are feeling more vigorous and endure more. Therefore, remember to breathe through your nose whenever possible. The surface of the sinuses is covered with mucous membranes which sometimes get inflamed because of virus or bacteria. This inflammation may cause severe problems like a headache, clogged nose and reduced energy and clarity. The very best way of reducing the risk of sinusitis (inflammation of the sinuses) is regular use of Rhino Horn. Using Rhino Horn keeps the passages into the sinuses open so that air circulates in and out of them. Especially if you have narrow openings into the sinuses, Rhino Horn is a very important tool.The use of Rhino Horn is also the best treatment you may apply against an established sinusitis. Often may the use of Rhino Horn mean that you avoid the use of antibiotics. The warm salt water dilutes the infected mucus in your sinuses and makes it easier for the body to get rid of it. Like with a cold you may use Rhino Horn several times after the other in one session, and you may repeat that several times a day. Sometimes you may have the feeling that water is entering the sinuses when you are using Rhino Horn, and this is not a problem at all if you are thorough with your emptying your nose after the cleansing. Especially in a cold climate, the emptying of water from the nasal passages is important after the use of Rhino Horn. Remember to be careful not to blow too hard while emptying your nose. Many ENT doctors are enthusiastic about the benefit of Rhino Horn in association with sinus problems. Allergy in the upper airways is an allergy to particles of dust or pollen. When dust or pollen enters the mucous membranes of the breathing channels, they react in different unpleasant ways. You may get a headache, get a clogged nose, i.e. swollen mucous membranes with excessive production of mucus, get running and sore eyes, get tired, feel a lack of energy. The benefit that the use of Rhino Horn may offer is removing the particles in your nasal passages and larynx and thus reducing the effect these particles may cause. During the pollen season (the season with the pollen you react to) you simply use the Rhino Horn several times a day and in this way stay clear of the pollen causing you a nuisance. Very many people with pollen allergy report great benefit from using Rhino Horn frequently during the pollen season. Very many ENT doctors, therefore, recommend people with an allergy to using Rhino Horn. “Let me begin by expressing my gratitude. I have been rinsing my nose once a day (on average) with the same blue Rhino Horn that I bought in 1999, and it keeps my hayfever symptoms down more than without using the Rhino Horn. I have tried shorter periods without but soon started using it again. As a GP I have recommended your Rhino Horn to many patients through the years. Medical Doctor from Fredrikstad, a town in the South Eastern part of Norway – March 2018. A nasal surgical procedure leaves a wound in your nose. It is important to keep this clean and to avoid itching scabs. ENT surgeons, therefore, are among the keenest advocates for the postoperative use of Rhino Horn. Rhino Horn is a must after nasal surgery. Some people work in a very dusty environment or an environment with a lot of other pollution in the air. For those, a nasal cleansing with Rhino Horn after work will give a better breathing and a better general feeling of wellbeing. Not only will the use of Rhino Horn clean the nasal passages, but it also will stimulate the cilia in the bronchial passages and the lungs so that particles there will be removed more efficiently. Many people live in polluted air in big cities. They would benefit a lot from regular use of Rhino Horn. We often hear that snoring may be reduced / stopped by the use of Rhino Horn. If the snorer uses Rhino Horn just before going to bed, snoring will be less disturbing for the partner. The British Snoring and Sleep Apnea Association is recommending Rhino Horn to its members. During pregnancy hormone changes in the pregnant woman’s body cause the mucous membranes to get swollen easier than in a normal situation. Breathing difficulty is the result. The warm saline solution you use with Rhino Horn has a “relaxing” effect on this swollenness. The pregnant woman thus gets relieved from this quite annoying problem. Interesting information here may be that all the mucous membranes of your body are one coherent system. The use of Rhino Horn affects the mucous membranes of the nasal cavity, but it also affects the mucous membranes of the bronchi and lungs. What may be surprising is that it also affects the mucous membranes of the intestines and the reproductive organs. If you (or your child) suffers from frequent middle ear inflammation, Rhino Horn is a very helpful device. French paediatrics have told us that they see fewer incidents of middle ear inflammation in children using the Rhino Horn than in other children. This experience was their reason to encourage us to develop a children’s model of Rhino Horn, Rhino Horn Junior. The mucous membranes in the nose, the pharynx, the lungs and the ears are interconnected. Between the back of the mouth and the middle ear is a canal meant to balance the changing pressure on the inside and the outside of the eardrum. If your mucous membranes get swollen, this canal may be blogged. This situation very often is the basis for evolving a middle ear inflammation. By using Rhino Horn to avoid the swollenness or get the swollenness down, you may avoid a middle ear inflammation. Medical doctors at lung departments in France and Sweden have told us that the use of Rhino Horn is very helpful to patients suffering from cystic fibrosis and other severe breathing diseases. Cleaning the nasal passages with warm saline water also affects the mucous membranes in the lungs. One effect is that the cilia, the small hairs on the sides of the mucous membranes, are stimulated to do their swaying movements. These movements will help bring mucus up from the lungs. Nasal irrigation is known in the Yoga tradition as Neti. Neti is part of the cleansing procedures, Shat Karma, which also involves tooth brushing, tongue cleansing and many other techniques. 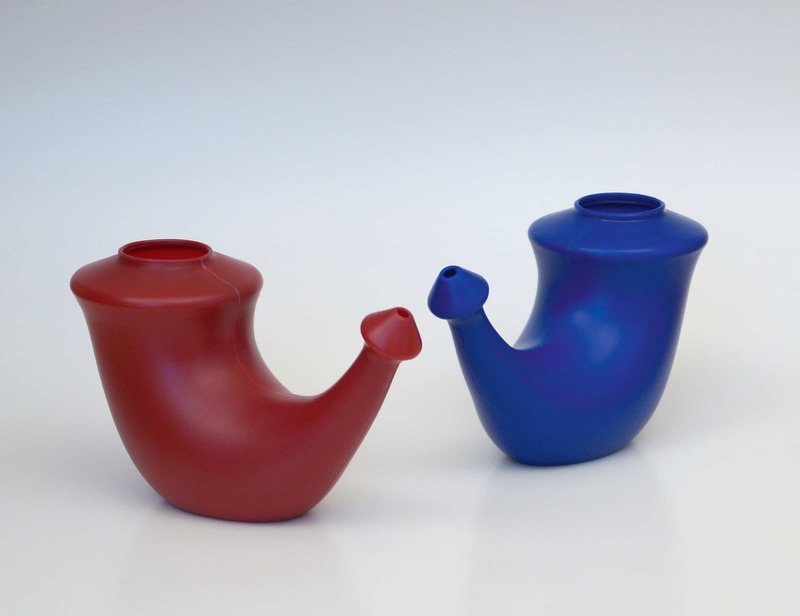 Neti with salt water is called Jala Neti, and another form of Neti is Sutra Neti using the cotton thread. The end of the thread is dipped in bee wax, which – when dried – will make the thread both stiff and flexible. This bee waxed end of the thread then is moved into one nostril, and then you pick up the thread at the back of your mouth and move the thread in and out of your nostril / mouth. 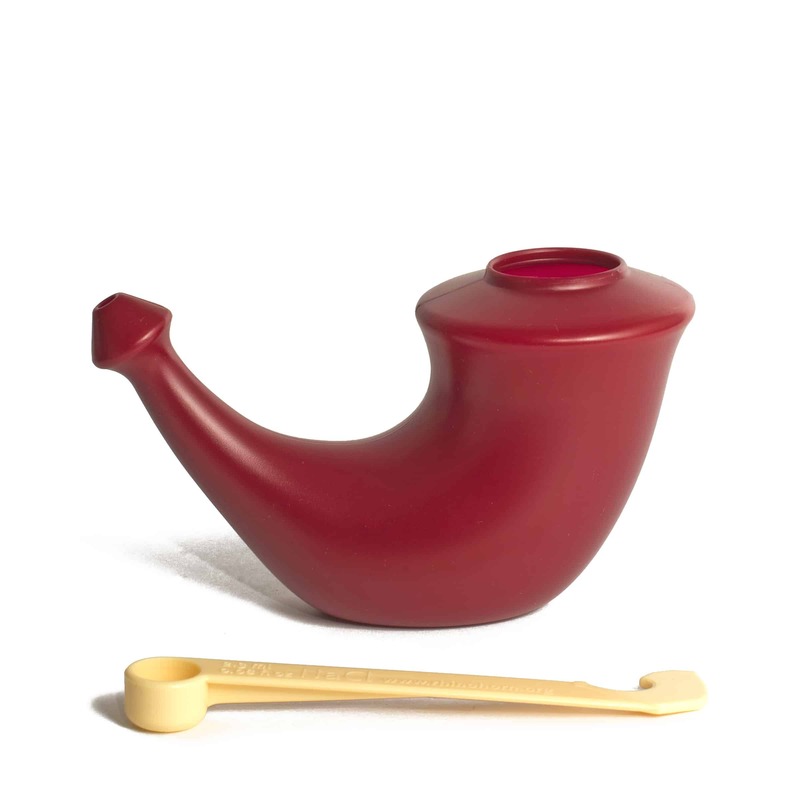 The yogic perspective why nasal cleansing is considered useful for yoga practitioners is two-fold: One reason to recommend Neti is that it results in open nasal passages making the air flow freely through the nose. This openness is, of course, useful for anybody, but it is especially beneficial if you are doing yogic breathing exercises or meditation. 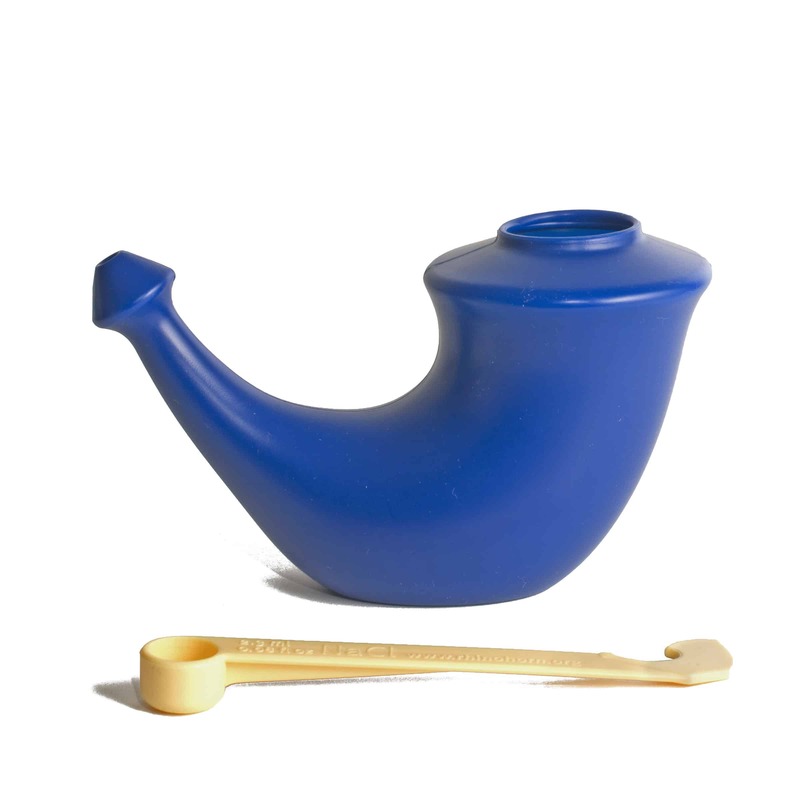 Another reason for recommending Neti is the relaxing effect the Neti user may feel in the forehead and the head. You feel refreshed and clear-headed.